To get the most out of Internet telephony, particularly if you are using it for business, it's best to use the new generation of VoIP (SIP) telephones or for the home user who does not require the features and functionality of a hardware phone, we would recommend a VoIP adaptor we also offer a range of networking devices and accessories such as headsets and network swicthes. We are a Service Provider - not just a retailer - so we only sell equipment that we know works well with our network and our range of Plug & Go Hardware Products is guaranteed to work with the Voipfone network 'straight out of the box'. 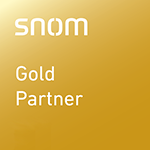 The Snom Service Provider scheme certifies that Voipfone is a competent provider of telephone services for snom hardware. To win advanced accreditation, our network must not only fully conform to international SIP standards and perform basic VoIP functionality but also fully support advanced PBX functionality. Features such as Call Transfer, Music on Hold, Voicemail, Busy Lamps and correct call handling and termination are required to work fully to meet this certification level.